Good morning friends~ Birgit here with you today and I've got a sweet baby gift to share with you. 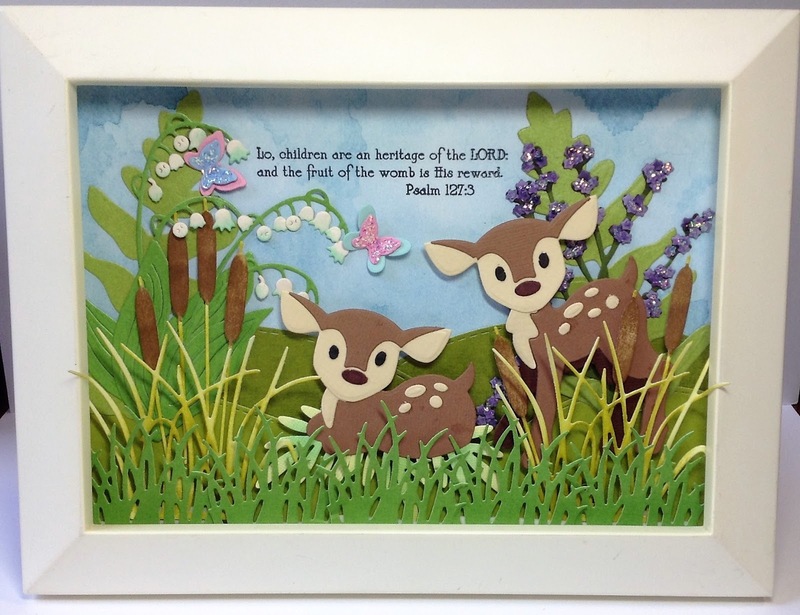 I made this little framed deer scene to give to a new mom as part of her baby gift. I started by cutting lots of different types of greens and flowers using some fabulous dies from Dies R Us. I'll list everything I used at the end of this post just to make it easier, since I cut way more than I needed or used for this project. I then added color using Tim Holtz Distress Inks and assembled the flower pieces. The Marianne Designs Deer were a special order from Dies R Us. I highly recommend adding your name to their e-mail list so you'll get the first in on special orders and lots and lots of magnificent sales! 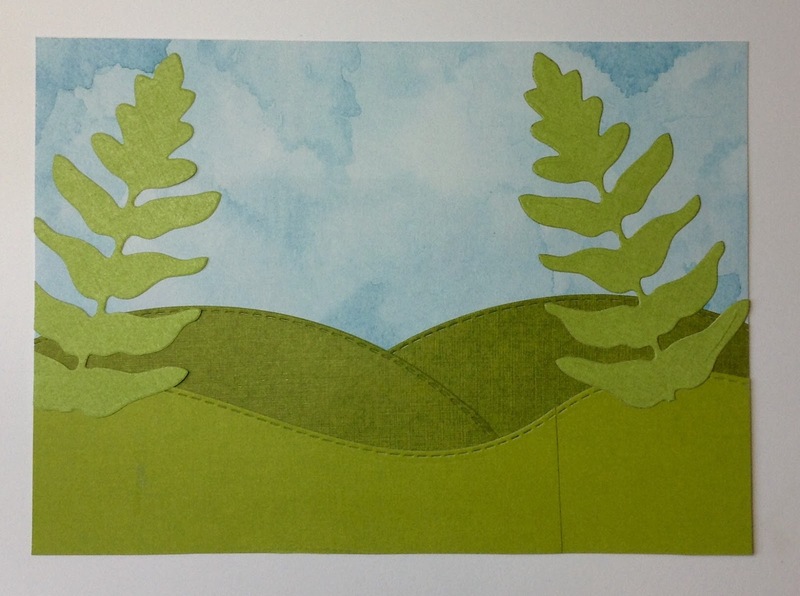 I built the base of the scene to fit into a 5"x7" frame, using stitched landscape dies. You can see where I had to add length to the scene to fit it into the frame but that line isn't going to show once I add all the other pieces. 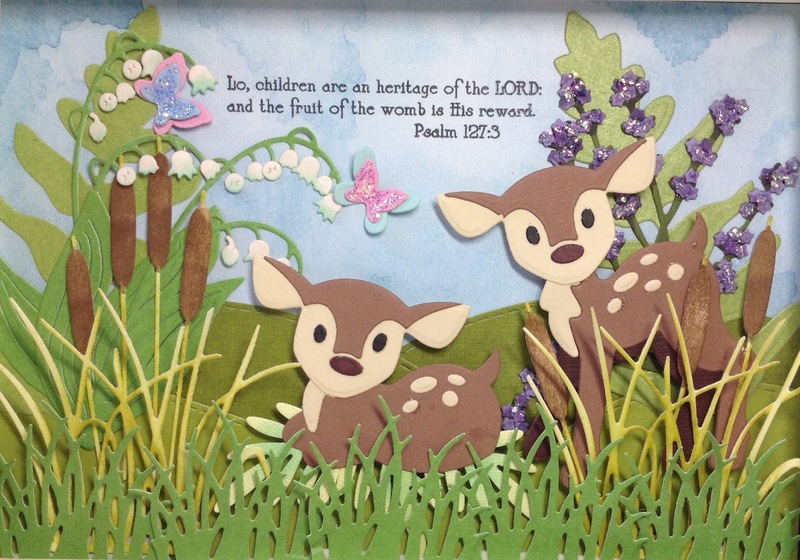 The fern dies are from Spellbinder and are no longer available but there are a lot of other fern dies available at Dies R Us. I played around with different layouts until I found the one that made me happiest and then started adhering the layers on. 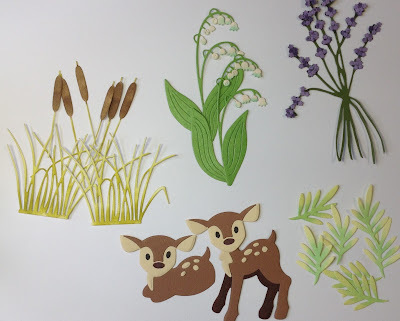 I built up the layers and added depth by using foam squares and glue dots that I rolled between my fingers for smaller pieces, like the cattails. 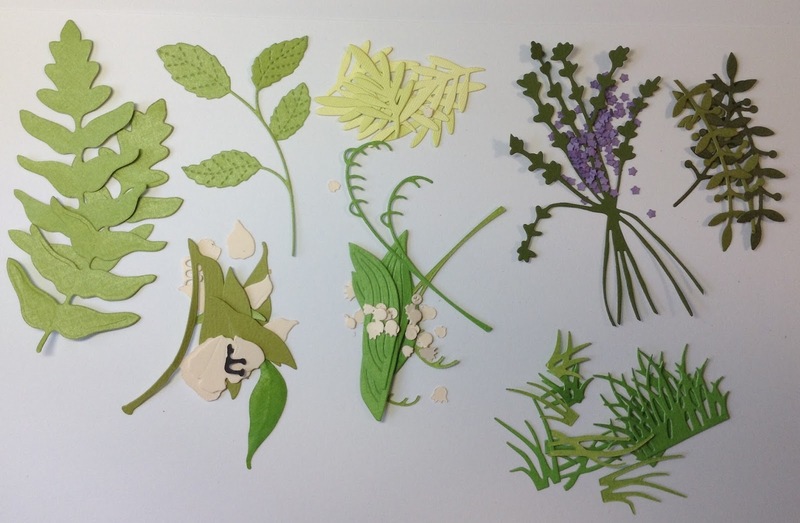 I added some sparkly Stickles to some of the flowers and butterflies for added detail. I stamped the sentiment from Sweet N' Sassy Stamps "Vintage Baby" onto the space left in the sky. Some cut grass fills the rest of the front. 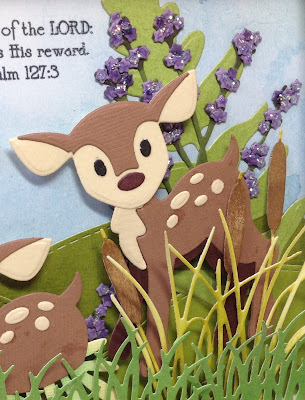 Be sure to stop by the Dies R Us Inspiration Blog daily for fresh new ideas and inspiration! 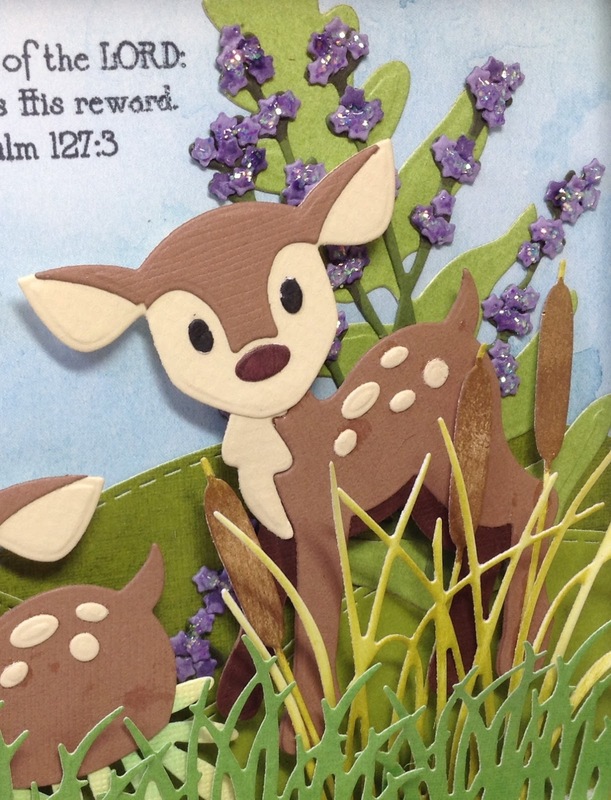 Join in on the challenges at the Dies R Us Challenge Blog and you could be their next winner! 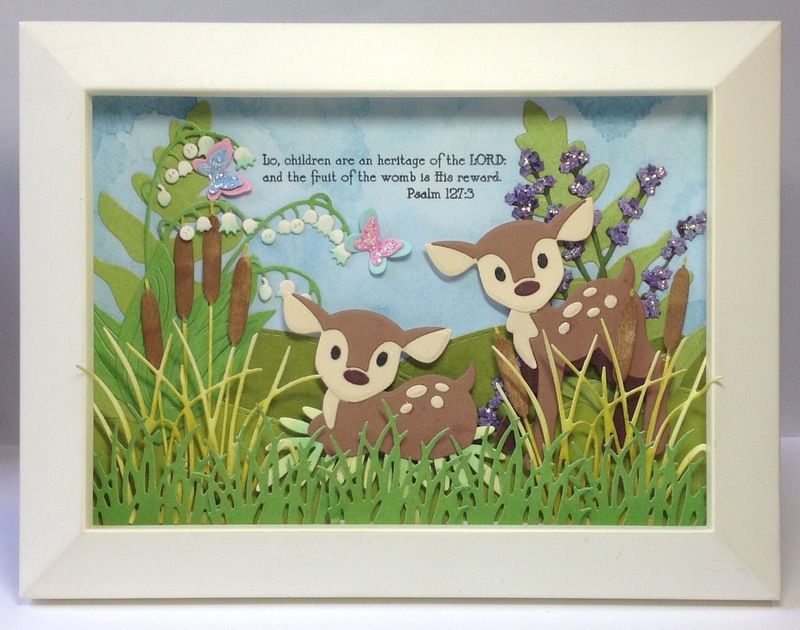 What a beautiful gift for a new baby Birgit! So much detail and dimension, it looks so real. 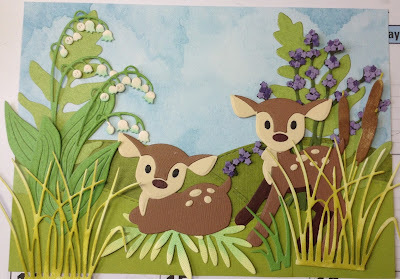 I love all the different greenery and flowers, and the deer are so cute. Such a lovely keepsake too. Such a lovely baby gift, a one of a kind made with love kind of gift!!! I am sure this will be a keepsake for generations! I am loving all of the details, wow so many wonderful accents to admire! Everything has been put together so perfectly! FABulous!!! OMG what a beautiful baby gift ... so adorable Birgit! 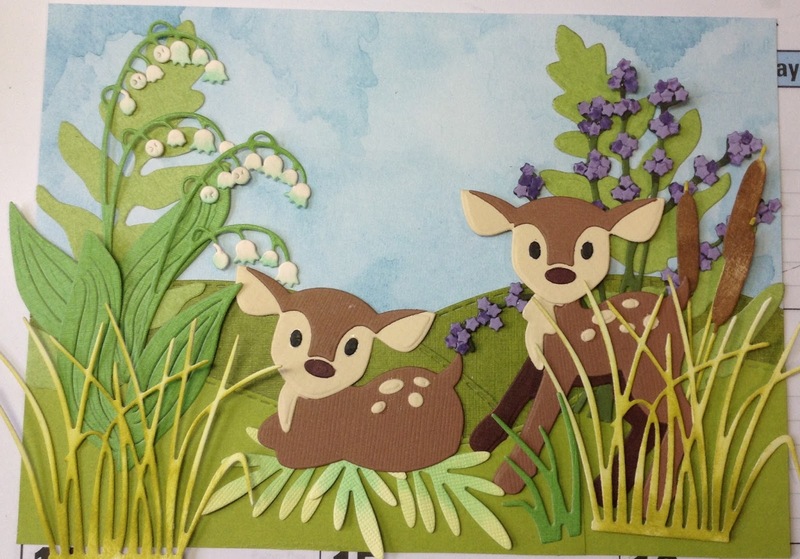 Such a soothing scene you've created with these adorable deer. Awesome inspiration!! Those deer are so adorable with their innocent faces. 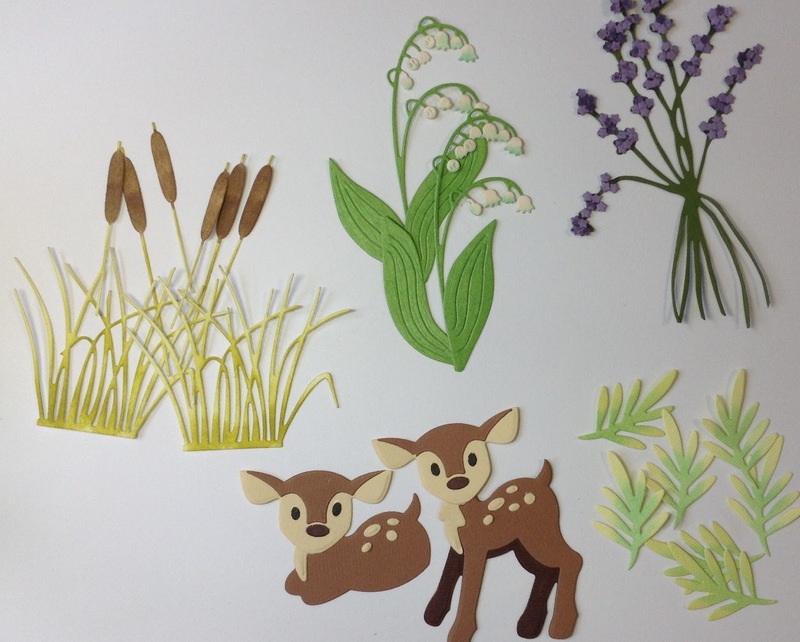 I like how you added the lily of the valley and cattails together. So cute! Oh, Birgit, it is a WONDERFUL gift idea! 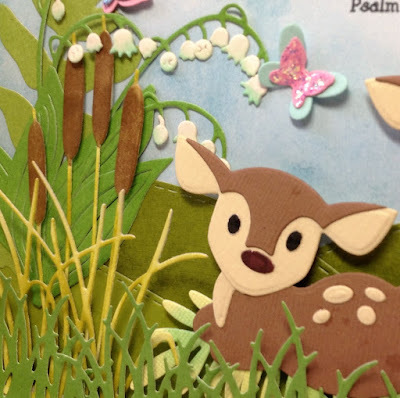 All those tiny details so carefully and lovingly placed in the sweetest of scenes! Your customization will make this a treasured keepsake! oh my goodness this is just totally adorable, you put together this scene just fabulous, everything is just perfect, great inspiration! !